Apart from a very brief period on the Southern Region the twenty two year six month career of D5245/25095 was spent allocated to London Midland Region depots. January 1965 to London Midland Midland Lines (LMML). August 1966 to London Division (D14) on loan. March 1967 to London Midland Western Lines (LMWL). 25095 was the 286th Class 25 withdrawn, one of three retired during July 1986. After withdrawal 25095 was stored at Crewe depot, then to Basford Hall Yard by March 1987. 25095 was moved to Vic Berry, Leicester on May 29th 1987 accompanied by 25034/037/190/199. The increased number of arrivals saw 25095 added to the stack by October 1987. Final cutting up started during late January 1989 and was completed by February 18th 1989. Photograph courtesy Jerry Glover. 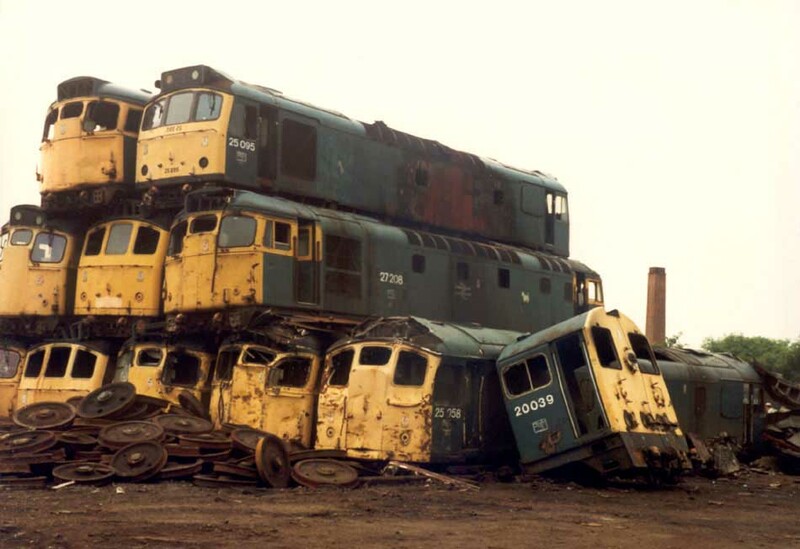 A badly burned 25095 sits atop 27208, whilst on the bottom row sits 25058 which has the cab of 20039 leaning against it. Scenes of course unique to Vic Berrys, Leicester - the date is June 5th 1988. Noted Crewe Works June - September 1969. Noted Derby Works January 1970. Noted Derby Works March & April 1974 (dual brake equipment fitted). Noted Derby Works January - March 1979 (Intermediate repair). Noted Derby Works May 1979 (remedial work?). D5245 was constructed at Derby Works during the last quarter of 1963, it went to Corby for its test run on January 20th 1964 and was delivered to Toton (16A) during the third week of January 1964. The Southern Region experienced a number of problems with some of their electric locomotives, with many temporarily sidelined awaiting attention. This created a shortage of locomotives leading to D5240 - D5245 & D5247 moving to Hither Green (73C) during September. Despite this somewhat unusual transfer there are no reports of how the locomotives were used or any photographs of them during their brief stay south of the Thames. D5245 returned to Toton (16A) during December. Transfers during 1965 remained within the LMR, becoming part of the Midland Lines allocation during January, then moving to Saltley (2E) later the same month. Whilst here during May the Type 2s had the possibility of being diagrammed for Birmingham New Street - Gloucester passenger workings, utilised at least as far as Worcester where a WR steam locomotive took over. During September D5245 was noted on a Glasgow Central - Wemyss Bay service. On July 31st the 08.30 Derby - Yarmouth was worked to Norwich by 5245 & 7503. On August 5th the summer dated roundtrip Nottingham - Llandudno Town was worked by 5245 & 5242. On July 21st the summer dated Roundtrip Nottingham - Llandudno Town was worked by 5245 & 5223. The 20.43 Birmingham New Street - Peterborough was worked by 5245 on August 5th. Photograph collection of webmaster 25095 ex-works at Derby, probably during April 1974 with Research Test Car 2 and an HAA merry-go-round wagon. The middle of August produced several passenger workings for 25095. On August 7th it worked the 15.43 Bangor - Euston to Crewe with 40033. Three days later (10th) 25095 worked a Derby - Skegness roundtrip with 25102. The following week, on August 17th the 07.35 Nottingham - Llandudno Town from Derby and the 13.00 return (to Nottingham) was worked by 25095. On March 31st 25095 & 25259 worked the 09.20 Birmingham – Poole as far as Reading. On June 21st 25095 & 25090 hauled a Blythe Bridge – Llandudno Town relief. 25095 & 25295 worked a roundtrip Melton Mowbray - Yarmouth excursion on September 6th. On May 30th the 08.50 Leicester - Skegness and the return Skegness - Leicester were worked by 25095 & 25076. A week later on June 5th 25095 & 25205 worked the Derby - Norwich - Yarmouth - Norwich - Walsall diagram. The same diagram would be worked on July 3rd but with 25099. Further tests with Warflat wagons took place between Derby & Long Marston with 25095 being noted on July 27th. 24081 & 25095 were noted at Basford Hall on March 8th with an up freight. 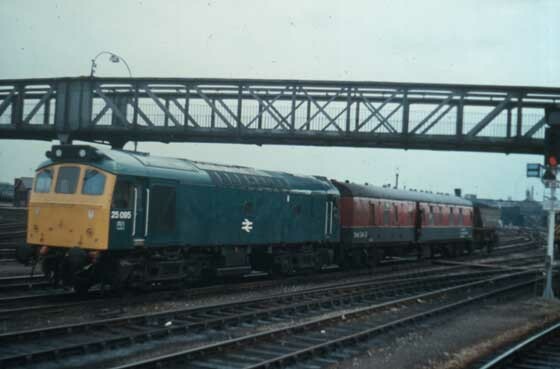 March continued to see the 15.15 Plymouth – Manchester receive mixed power from Gloucester, observed were 25095 (13th), 25133 (14th) and 25118 (22nd), the latter in charge of ten coaches. 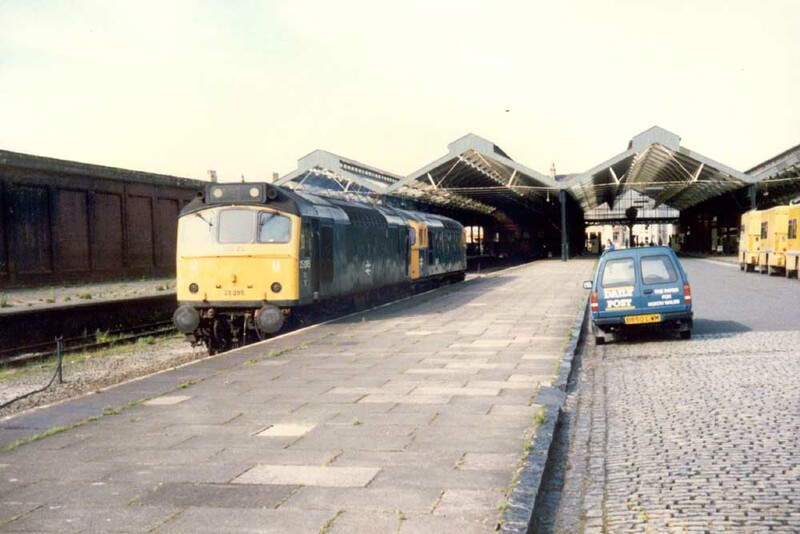 When the summer schedules commenced on May 26th the 10.10 Euston – Aberystwyth went forward from Birmingham New Street behind 25032 & 25095, returning with the 16.10 Aberystwyth - Shrewsbury. Because of the implications of a recent derailment the Class 86/0s regained their 80 mph speed restriction whilst the use of Classes 81 – 85 was permitted on air braked, air conditioned trains. 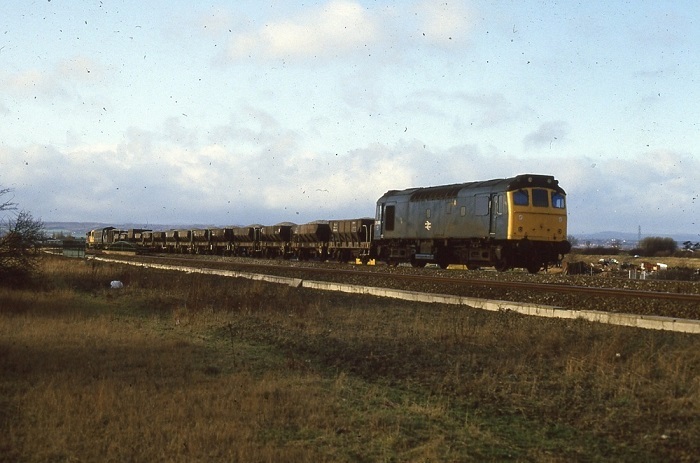 Despite these alterations the northern end of the WCML saw a number of electrically hauled freights substituting with diesel power including the use of Class 25s. So noted were 25095 on February 20th's late evening Willesden – Runcorn freight and 25105 & 25159 on February 21st's mid-day Carlisle – Severn Tunnel Jct freight. On June 1st 25095 & 25210 worked the diverted 23.59 Sheffield - Euston between Bedford & Euston. The 08.02 Walsall - Yarmouth to Norwich and the return 14.15 Yarmouth - Derby from Norwich were worked by 25095 & 25107 on June 14th. Engineering work on the WCML on November 23rd saw the 20.45 Barrow - Euston with 86224 dragged between Bletchley & Watford Junction by 25095. The London area appears to have been the venue for a number of short passenger workings for 25095 during 1981. On March 1st the 01.07 Holyhead - Euston was assisted from Stonebridge Park by 25095 due to the power being off for engineering work. On April 20th and June 3rd 25095 handled the Willesden - Kensington Olympia legs of Motorail services with respectively 25319 and 25054. 25095 moved to Toton during February. Photograph collection of webmaster. Sometime during 1982 25095 is noted on a ballast working at Saltney Junction. On November 15th 25095 was noted eastbound at Buxworth with empty ICI bogie hoppers for Tunstead. 25095 moved to Cricklewood during January. On April 14th 25095 was on banking duty at Great Rocks Junction. 25095 received its last 'E' examination at Crewe during May. 25076 & 25095 worked the Cranmore - Ellesmere Port bitumen tank empties on a sunny June 14th. 25095 was noted southbound at Clifton with a parcels train on June 30th. On July 1st 25095 was noted passing Warrington Bank Quay with parcels stock. On July 16th the 06.55 Blackpool North - Manchester Victoria failed at Preston behind 40063, 25095 worked the train forward and then worked the 08.40 Manchester Victoria - Scarborough to Leeds, being replaced here by 47314. 25095 was noted southbound at Nuneaton with cement Presflos on August 4th. Engineering work between Rugby & Bletchley on August 14th saw 25095 & 25300 assist at least two southbound workings. Ten days later on August 24th 25095 worked the 01.30 Holyhead - Birmingham New Street to Crewe. On August 26th 25095 was northbound at Stenson with bogie oil tankers. On October 7th the 17.03 Euston - Blackpool North was worked forward from Preston by 25095. 25095 was stabled at Bescot over the Christmas break. 25095 was stabled at Northwich on January 30th. During January 25095 moved to Bescot, whilst here one of its more unusual workings was to cover for a shortage of a diesel multiple unit on February 8th's 16.35 Derby - Nottingham, coming back with the 17.20 to Birmingham New Street, but only working as far as Derby, where a serviceable multiple unit substituted. Class 25s were still frequent visitors to Parkeston, often heading back to the LMR on the evening Parkeston – Ditton working, so noted were 25211 (Jan 27th), 25199 & 25231 (Feb 8th), 25095 & 25212 (Feb 16th). 25095 was stabled at Manchester Victoria on June 2nd and was the pilot/banker on June 9th. 25095 & 25154 handled August 8th's 07.35 Euston - Aberystwyth forward from Wolverhampton returning with the 14.00 to Shrewsbury. On September 6th 25095 was noted passing Winwick Junction southbound (?) with a train of condemned passenger stock, all windows were boarded up. 25095 was noted at Crewe station on a wintry February 2nd. On February 10th 25095 worked the 03.57 Crewe - Birmingham New Street to Stafford due to the power being off for engineering work. 25095 was noted with a short parcels working at St Andrews Junction, Birmingham on March 2nd. 25095 was noted at Oxley carriage sidings on April 19th. The 07.20 Manchester Victoria - Liverpool was worked by 25095 on June 24th. Two days later (26th) 25095 was noted eastbound at Chinley with a train of scrap metal. The final transfer for 25095 came during July when it was transferred to Crewe. On July 2nd 25095 worked the 07.19 Manchester – Cardiff, returning north with the 12.00 Cardiff - Nantwich, then the 16.40 Nantwich - Shrewsbury, the 17.45 Shrewsbury - Nantwich, the 20.54 Nantwich - Cardiff. The next day (3rd) 25095 worked the 12.00 Cardiff - Nantwich, the 16.40 Nantwich - Shrewsbury, the 17.45 Shrewsbury - Nantwich and the 20.54 Nantwich - Cardiff. The services were terminating at Nantwich due to the remodelling of Crewe station. On July 4th 25198 & 25095 worked the 6V32 Ellesmere Port - Cranmore (?) bitumen train, being noted passing Hereford. A week later on July 9th the Parkeston – Arpley tanks was noted at Chesterfield behind 25032 & 25095. On July 30th 25095 & 25200 were stabled in the westbound goods loop at Stalybridge with an oil train. The 16.15 Glasgow Central - Liverpool was worked forward from Wigan N.W. by 25095 on August 16th, the electric locomotive had worked to Wigan because there were no spare diesel at Preston. On August 23rd 25095 worked the daily parcels service from Edinburgh Waverley to Glasgow Salkeld Street, the consist included a Travelling Post Office. 25095 was stabled at Severn Tunnel Junction on September 8th. On September 22nd engineering work saw a short diversion between Acton & Willesden with 25095 assisting many services over a very short distance. 25095 was stabled at Warrington Arpley on October 19th. On November 26th 25095 was noted shunting the Tunnel Cement siding at Pen y Ffordd whilst working a mixed Speedlink service. 25060 & 25095 worked the Stanlow - Neville Hill oil tanks on a wintry November 29th. Class 25s visiting the Huddersfield area in early December included 25095 & 25145 (4th) on oil tanks. On January 5th a Bristol Temple Meads - Birmingham New Street relief was worked by 25095. 25095 was noted shunting loaded ballast wagons at Carnforth on March 3rd. Photograph courtesy John Powell. 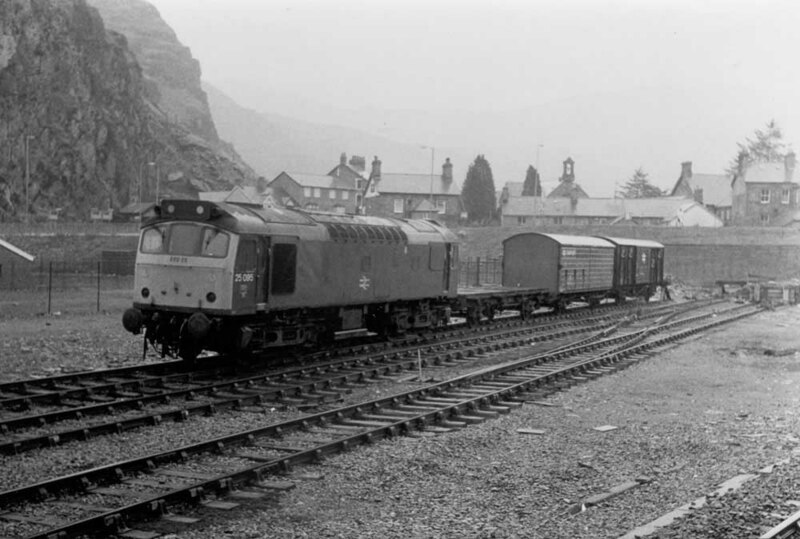 Its definately a rainy, misty March 18th 1986 at Blaenau Ffestiniog as 25095 waits for the run back to Llandudno Junction. It now sports its unique cab front livery, and carries the number '59052' below the center window. On April 9th 25095 worked the 6F79 Aberystwyth - Stanlow empty oil tanks. The last known passenger workings for 25095 took place on April 17th substituting for a multiple unit on the 10.01 Bedford - Bletchley, a Bletchley - Bedford and the 16.19 Bedford - Bletchley. Photograph courtesy John Powell. May 22nd 1986 finds 25095 assisting 33016 at Llandudno station. The Class 33 has run out of fuel. Did 25095 cover its return working? 25095 has now acquired a second set of numbers on the cab front. On May 29th 25095 was noted northbound through Warrington Bank Quay with an engineers train. On June 8th 25095 was stabled at Warrington Arpley. 25095 was stabled at Crewe Diesel depot on July 27th. 25095 was withdrawn on July 28th 1986. Photograph courtesy Steve Houlker. Its July 27th 1986 at Crewe depot and 25095 has been out of service for four days. 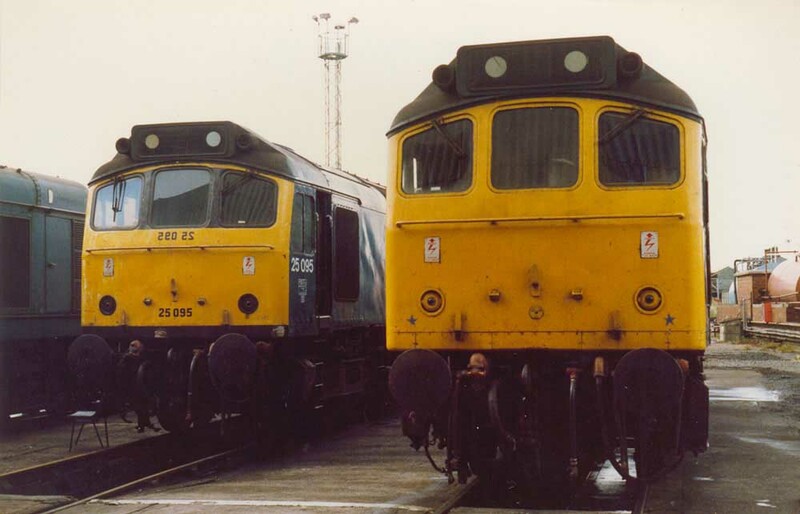 The standard yellow fronted Class 25 on the right shows just how much 25095 has been customised with extra numbers and other paintwork 'improvements'. No. 1 cab, 2nd man's cabside: unpainted window frame: March 1984 - October 1985. No. 2 cab, 2nd man's cabside: unpainted window frame: August 1985 until withdrawn. No. 2 cab, driver's side corner: rust areas on valencing and at same height as the marker light: June 1983 - October 1985. Both cabs: modified livery - black added to the cab front valencing and the three cab front window surrounds; reversed numbers added below center window and later numbers placed below center lampbracket. Three of the four customizations added sometime between October 19th 1985 & November 29th 1985. The addition of the number below the center lampbracket took place at a later point in time (sometime between March 18th 1986 & May 7th 1986).